Sarah Dettman’s friends and family helped with this Sunflower painting to help brighten a community laundry room. It’s my pleasure to present it to all of you out there in WordPress world! Tah-Dah! Wouldn’t this help brighten your laundry chores?! Perhaps that should be a long-term goal of mine! Helping bridge community spirit through art! Oh, I love it SOOOOOOOO much! thank you amiga! sunflowers are so happy! my friend didier has an art show/inauguration in cuenca in early july… will lob that info to you soon. They are happy flowers, aren’t they? I suppose they represent positive attitude with those strong bold colors, and their size always gets one’s attention.. in real life or in mammoth blow-up sizes! Sista Sista….top of the mornin’ to you! What joy…to have “purpose” not only for yourself…but for others, as well. Community. Oh yes, I crash and burn! That is one of the reasons I am in Mindo, a stopover before I get home and take care of all that’s been neglected while I’ve been w/the tour, with my friends, painting, playing tourist, etc etc. Usually an early riser, I sleep late if I stay up late. When I throw myself into a painting, I usually take a few days off and do little escept watch nature, read books, rest, visit friends. After a long paiting marathon at home, I need to disconnect and interact with society. If an impromptu painting session arises, it’s a win-win moment! Long ago I was a speaker on the American Queen when they had their Inn Country Theme Cruises on the MS river… My colleagues would say, “I’m going to take a Brunetti.” and I asked, “What?!! !” and they smiled and said that my ten-minute naps always revived me, so they were going to do the same! Said it already today but I”ll say it again, this brings me joy through it’s beauty and color. As for “taking a Brunetti”, are you referring Donna Leon’s Brunetti, one of my favorite people? Would you believe that I’ve not read those? Whenever I get to a bookstore, I’ll load up and enjoy taking a timeout! My last name is Brunetti, so that’s what they called me on the boat! I would meditate in that laundry room. Thank you for a wonderful idea. Once we are settled in Pedasi, Panama, matbe we can begin some “Brighten the Local Community” projects, but only after asking if this would be something the community wants! You are so right, but I suspect the community will embrace this idea! Everywhere I go, the people are so eager for someone to teach them new options, especially creative ones. I often help them, and i insist that they help and not just watch… we’re all here to learn and we’re all here to help/teach. Thanks, and good luck! This is perfect and what a better place for such cheer! Thanks! I hope that everyone enjoys working with me!! My biggest challenge is assuring them that – no matter what they do, it’s going to be ok! Everyone should have a beautiful laundry space! I love watching your community minded projects and the way the community is encouraged to participate. Wonderful community building! Bright and beautiful art, thank you. i rarely have trouble sleeping and can drop off in seconds if i close my eyes. perhaps part of it is b/c i use my eyes for my work – steady intense focus, and sometimes i don’t blink while pulling a straight line w/a fine brush.. perhaps you should try fine art detail to see if it helps you sleep! Thank you for visiting and the sleeping tips! Your site reflects your wonderful attitude…keep spreading it around. I’m another who drops off to sleep in an instant, and never wakes until morning – well, unless miss kitty decides it’s time for me to get up and fill the food bowl, or whatever. I think part of it’s being active during the day, and part of it’s the result of a long, long journey from thinker to doer. When are days are filled with the satisfactions of creativity (of any sort) I think rest becomes a blessing, a time to allow the well to refill. that’s a very interesting way to view it! i go almost instantly into dreaming as well, and it seems that i dream all night! yes, our creative minds probably cherish the moment we shut down for the night! Lisa your art is not only colourful and cheerful it is the way you share your art involving people in creating joy. This is what life is all about caring and sharing. Beautiful sunflowers! I adore your comment that “we’re all here to learn and we’re all here to help/teach.” I think that’s a wonderful philosophy for living! Thank you! Cindy, you continue to be so kind! You would be here helping spread sunshine through sunflowers or whatever bright happy art seemed right for the moment! thank you! it was a fun project! When I saw this daily post pop up, I knew you would respond and I’m so glad that you did. Your art brightens every little corner of the world. I’m thrilled that I can share one little corner of your sunny, happy art. ha! did you see today’s? how can i NOT do that one as well? about to do that now, then switch to painting.. my sketches patiently await! Fabulous, just love it and I’d definitely have it in my laundry room – heck, why not out on the back porch? I’d want to see it every day! 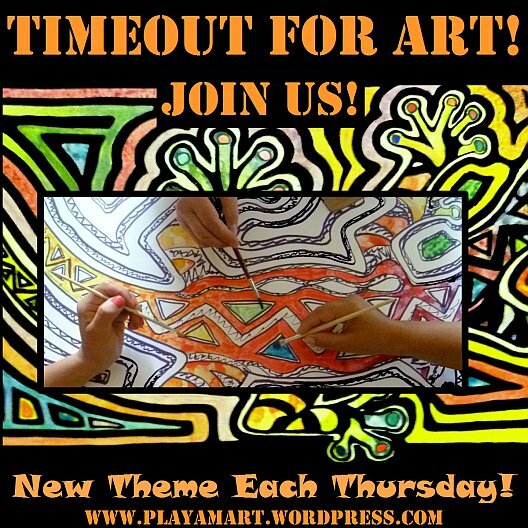 Love your designs, creativity and how everyone joins in the celebration of painting! Thanks, Paula! I nicknamed her ‘Miss Nasturtium’ – just after that she posed in front of the nasturtiums! She is a precious little 3 year old! The dogs adore her and sometimes knock her down! She protests, and Momma rescues her! What a bright & cheerful laundry room! If I had that, I wouldn’t dread doing my laundry so much. yes, the sunflower painting really brightened that space! that’s why we selected that area – b/c people spend a lot of time there, and it’s best they had something to smile at them! yes, that was a fun project, and I think i will soon paint a big one of sunflowers for my own enjoyment! aha! i’m glad you have a plan! this is going to be fun! I love reading the comments. It always add another dimension and fills in the gaps…like how you do it…endless energy. Sounds like you have a recipe that works for you. Am glad the extra time in Mindo was a respite for you, even though you ended up designing a sign for the hostel. We are on the road and my comments are sporadic and not in order. Time with family and friends in North Carolina as we gather together for Ron’s mom’s internment. A bitter sweet time. Thanks again.. and again! You’re tireless with your encouraging and positive comments! Yes, Mindo was a perfect spot to throw on the brakes.